Unique shipping, storage, and work-in-progress containers maximize your space. 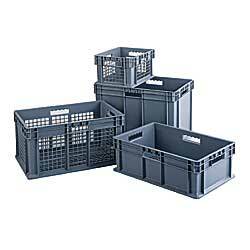 High-density polyethylene construction features straight walls for orderly storage and palletizing during shipping. Strong stacking rims and external ribbing provide added strength. All container sizes stack together. Hand holes on all four sides ease lifting and carrying. Available in three styles. Sold in carton quantities only. Color: gray. IN STOCK. XJ-996 29	 0.9	 Mesh Side/Base	 12	 16" x 12" x 8"	 16 x 12 x 8"
XJ-1000 16	 1.8	 Mesh Side/Base	 4	 24" x 16" x 8"	 24 x 16 x 8"
XJ-1004 15	 2.7	 Mesh Side/Base	 3	 24" x 16" x 12"	 24 x 16 x 12"
XJ-1008 13	 3.6	 Mesh Side/Base	 2	 24" x 16" x 16"	 24 x 16 x 16"
XJ-997 35	 0.9	 Mesh Side/Solid Base	 12	 16" x 12" x 8"	 16 x 12 x 8"
XJ-1001 19	 1.8	 Mesh Side/Solid Base	 4	 24" x 16" x 8"	 24 x 16 x 8"
XJ-1005 17	 2.7	 Mesh Side/Solid Base	 3	 24" x 16" x 12"	 24 x 16 x 12"
XJ-1009 14	 3.6	 Mesh Side/Solid Base	 2	 24" x 16" x 16"	 24 x 16 x 16"
XJ-998 40	 0.9	 Solid Side/Base	 12	 16" x 12" x 8"	 16 x 12 x 8"
XJ-1002 21	 1.8	 Solid Side/Base	 4	 24" x 16" x 8"	 24 x 16 x 8"
XJ-1006 21	 2.7	 Solid Side/Base	 3	 24" x 16" x 12"	 24 x 16 x 12"
XJ-1010 18	 3.6	 Solid Side/Base	 2	 24" x 16" x 16"	 24 x 16 x 16"